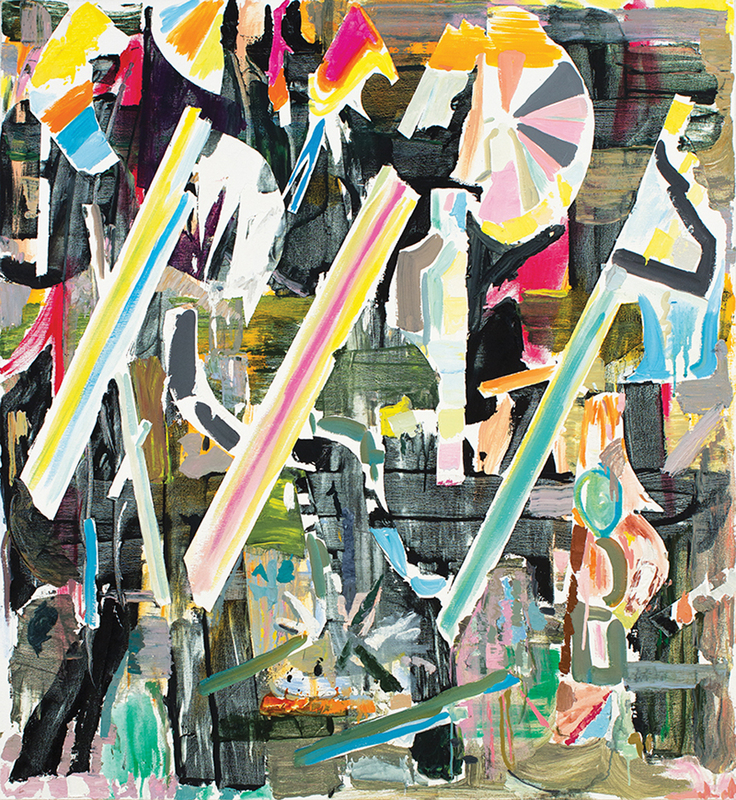 The Painting Center is pleased to present Discard Parade, an exhibition of recent paintings by Thomas Berding in the main gallery. In Thomas Berding’s paintings, both the history of abstract painting with its encrypted images and performative character, and DIY aesthetics with its notions of reuse and reexamination of value exert constant pressure. Continuing an established line of inquiry in his studio practice, this new series of paintings also identifies the fragility of representation and the insistence of materiality as recurrent themes. At the same time, these works draw from an idiosyncratic archive of material culture, including explosion views common in instruction and assembly manuals, images of flow charts and visual models, and encrypted texts and screen based symbols. Alternating between moments of seeming bravado and passages of layered speculation, the paintings in this exhibition splendidly illuminate the shifting nature of language and wear the material process that bore them. The resulting works’ facture is the evidence of a cumulative process, a piecing attempt to fit these multiple hacked, masked, edited, and gestural shards together. Picturing a world in a simultaneous state of construction and disassembly, if a kind of wholeness or singularity appears what emerges is a tenuous peace within a field of remnants and surplus. Thomas Berding was born in Cincinnati, OH and received an MFA from Rhode Island School of Design. His paintings have been widely exhibited and recognized with awards from the National Endowment for the Arts, Pollock-Krasner Foundation, and NEA/Mid America Arts Alliance. Berding currently lives and works in East Lansing where he is an Associate Professor of Studio Art at Michigan State University.